The town takes its name from Loch Riach (Irish for “the grey lake”) on which it lies. It is also suggested that the town’s name derives from Loch Riabhach (meaning “speckled lake”). The town is located within an area that was historically called Trícha Máenmaige (Kingdom). The town was Walled but unfortunately the walls do not exist anymore but one of the towns gate towers is in perfect condition and is located next to the cathedral. The town moat is the only fully functional moat on the island. The Carmelite Abbey was established in 1645 and The Marquis de St Ruth (General Charles Chalmont), the French Jacobite general who commanded the Jacobite forces in the Battle of Aughrim (1691) is buried in the Graveyard. Loughrea was traditionally a farming town that cut its industrial teeth with Tynagh Mines, 6 km (3.73 mi) to the east. Tynagh was for 15 years (1960–1975) the most important zinc and silver mine in Ireland. There is now a Gas Powered electricity power station on the site of Tynagh mines. As well as being a dormer town for Galway, Loughrea now hosts a number of pharmaceutical and data-processing industries. Tourism and small cottage industries also play an important role in the community. Loughrea’s tourist infrastructure is supported by several hotels, a country-resort, as well as many bed and breakfasts, restaurants, coffee-shops and pubs. The Cathedral of St. Brendan on the lakeshore, in the town centre, is considered an important repository of Celtic-revival art and architecture in Ireland. St. Brendan’s Catholic Cathedral was designed by William Byrne in 1897 and completed five years later. Its double transepts are an unusual architectural feature. It contains some very fine internal decoration. 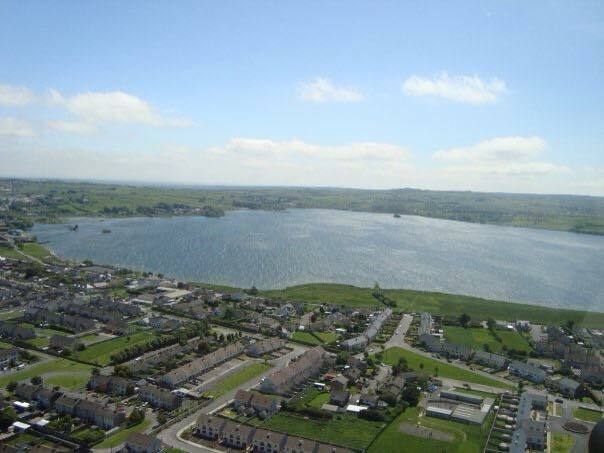 Spring-fed, Loughrea Lake overlooked by Knockash is popular for trout, pike and perch fishing. The lake is home to many waterbirds. Migratory species from Europe live at the lake during the winters, and it provides nesting grounds for other species during the summer. The lake is listed as a site of international importance for the Shoveler and a site of national importance for the Coot and Tufted Duck. In addition it is frequently used for water sports and swimming. Immediately behind the Loughrea boathouse are the remains of an old crannog. The Loughrea dwellers of another time would have sought protection from raiders by living in comparative security provided by the lake. Loughrea is connected to the M6 Dublin-Galway motorway via the N65. The town was historically served by the Midland Great Western Railway and a railway branch from Attymon Junction, until 1975. 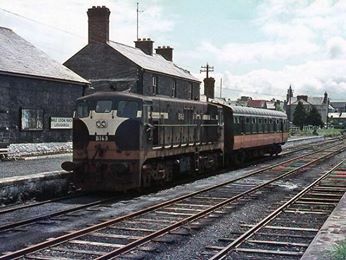 This line was Ireland’s last operational rural railway branch line, having outlasted most other country railway lines of this type by 10–20 years, and even surviving to have diesel trains used on it. The link road from the proposed Ballinasloe – Galway dual carriageway to Loughrea removed most of the remains of the original track bed. Loughrea railway station opened on 1 December 1890 and finally closed on 3 November 1975. Each year, in October, the town plays host to the BAFFLE International Poetry Festival (www.bafflepoetry.org). Loughrea also boasts a Musical and Dramatic Society, Historical society, and an active community association. In the 2006 National Glór na nGael awards for “Irish language in local communities”, Loughrea’s “Glór committee” was awarded first prize. Glór has an umbrella committee which involves local organisations in the promotion of Irish. Local group, Gaeilge Locha Riach, promotes the Irish language in Loughrea among the community and businesses.